In the present scenario, Tweeting has become a part of human life. But sometimes it embarrassed you on the social media platform. Keeping this in mind Sepia Software LLC developed a handy application named as Tweet Cleaner for iPhone mobiles. With a rating of 4+ on the App Store, the app is capturing the IOS platform gradually and meeting the user expectations remarkably. Tweet Cleaner for iPhone costs $1.99 and can be downloaded from iTunes App Store. 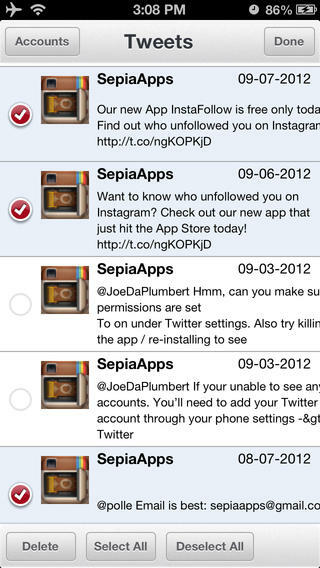 The main function of Tweet Cleaner iPhone app is to delete the unwanted tweets on Twitter. Twitter permits you to see last 3,200 Tweets on the account. Tweet Cleaner let’s you see older tweets by keeping a searchable history archive. The search of tweets can be accomplished with keywords in a search tool bar, date ranges or with a particular date. It stacks your last 3,200 Tweets, and then keeps adding more every time you launch the application. This would let you to delete even very old tweets in the history. Also there is no need a get a new Twitter account, the app let you keep you the same screen name. The user interface of iPhone Tweet Cleaner app is simple and smooth. The blazing performance of the app can be seen in the multiple selections of tweets and deletion in just few taps. The app confirms twice from the user before deleting tweets. Tweets on the twitter are generally archived after twenty four weeks. This tool gives an ability to a user to delete the tweets before twenty four weeks in order to prevent archiving. Tweet Cleaner app for iPhone requires iOS version 5.0 or higher. The application is compatible with iPhone, iPad and iPod Touch. There were few technical glitches which are already fixed and app is responding well. If you are a social media freak who spent at least a part of the day on Twitter, this social networking application is a good bet considering its cost and benefits.